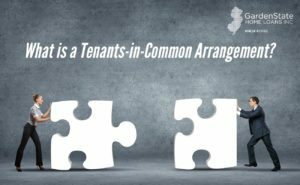 What is a Tenants-in-Common Arrangement? Tenants-in-common is an arrangement that is characterized by multiple people deciding to purchase one property together. This can be either a primary residence or a vacation home. Basically, a tenants-in-common arrangement is a split homeownership among multiple people. A tenants-in-common arrangement does not have to be an equal ownership. Tenants can own different percentages of the same property. Tenants-in-common provides a framework for buyers to structure how the property operates. This includes decisions on how to split costs associated with the home to more major decisions concerning the property. While each person owns a share of the property and has rights to live on and use the property, the amount they pay for the mortgage, insurance, and maintenance will vary based on the ownership share. A big advantage of this agreement is the financial advantage. For people who can’t afford to buy a property on their own, a tenants-in-common arrangement works well. 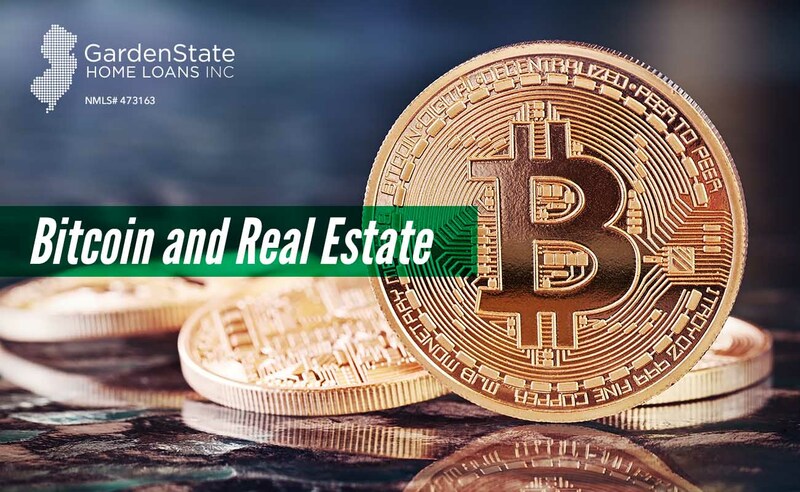 This is because all deposits and payments are divided, making the purchasing and maintaining of the property to be less expensive. Borrower capacity may also be greater when an individual with a higher income owners a larger percent of the home. Tenants-in-common may also be attractive for people who only plan on using a home for a short period of time, such as during the holidays or the summer. If this is the case, the person can choose to have a smaller share of the home. Finally, a tenants-in-common arrangement allows individuals to choose who gets their share of the property in the event they die. They can also choose to sell their ownership or pass it on to someone else should they not want the property anymore. 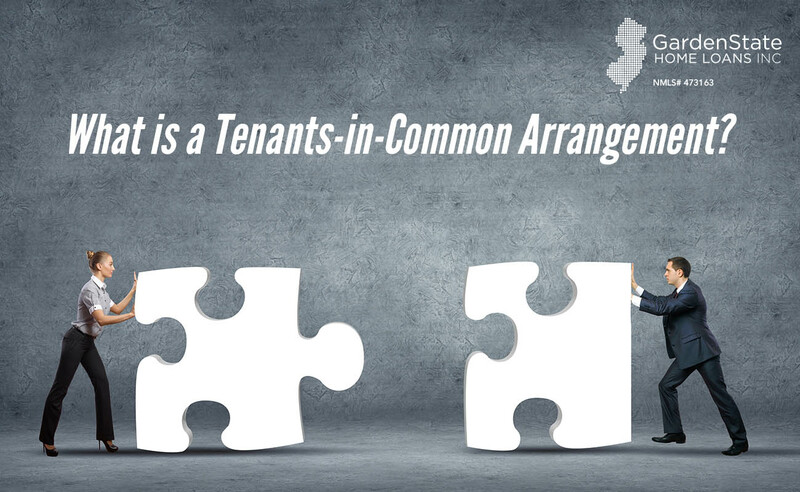 While it can be an advantage that a tenants-in-common arrangement is easily transferable, it can be a disadvantage for others. Any owner can sell their share at any time without the consent of the other owners. This could result in the other tenants living with someone that they don’t know or like. Since everyone is responsible for payments, if one or more borrowers cease their payments, the other tenants must cover the payments or face foreclosure. Tenants may also file a partition action, which would force unwilling co-tenants to sell the property. 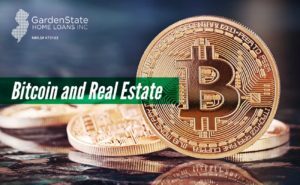 https://www.gardenstateloans.com/wp-content/uploads/2017/12/tenants-in-common.jpg 800 1300 Dori Gelman https://www.gardenstateloans.com/wp-content/uploads/2017/05/fb_logo-300x141.jpg Dori Gelman2017-12-19 16:30:372017-12-19 09:17:35What is a Tenants-in-Common Arrangement? Once a loan goes through the loan processor, it is handed off to an underwriter. 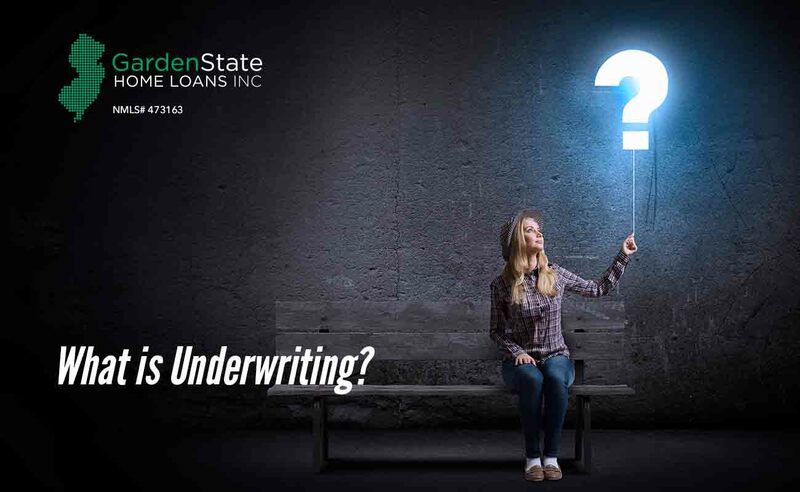 During the mortgage underwriting process, an underwriter will ensure that your financial profile matches the guidelines of the lender and the loan. Ultimately, the underwriter makes the final decision on whether to approve or deny your loan request. The main task of an underwriter is to assess the risk associated with a borrower. An underwriter will look at things such as declarations of bankruptcy, foreclosure, if you have paid your bills on time, and your credit score to see how you manage debt. This will help them determine your ability to make your mortgage payments. Underwriters use these three C’s to determine the risk associated with a borrower. An underwriter will look at your repayment and credit history. Credit is one of the most important aspects of the loan approval process. Your credit report will show how you have handled your past bills. This will also help the underwriter predict your ability to make your mortgage payments on time and in full. Underwriters will analyze a borrower’s employment, income, debt, and asset statements to ensure you have the means to pay off your debts. They will take a close look at your debt-to-income ratio to see that you have enough money to cover your current debts and your new mortgage. In addition to looking at the above statements, an underwriter will also review your savings and checking accounts, your 401(k), and your IRA accounts. This is because an underwriter wants to ensure that if something happens, such as illness or a loss of job, you are still able to pay your mortgage. Collateral refers to the value and type of property being financed. The underwriter wants to make sure that the loan amount does not exceed a property’s value. This is because, in the case of default, a lender may not be able to recover the loan’s unpaid balance. To correct asses the property’s value, an underwriter will order a home appraisal, which will assess the home’s worth. The property type is also important to the underwriter. 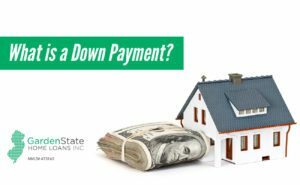 Lenders assume that borrowers are more likely to walk away from an investment property than they would from a primary residence. https://www.gardenstateloans.com/wp-content/uploads/2017/12/what-is-underwriting.jpg 800 1300 Dori Gelman https://www.gardenstateloans.com/wp-content/uploads/2017/05/fb_logo-300x141.jpg Dori Gelman2017-12-15 16:30:002017-12-15 09:21:32What is Underwriting? Eviction is a landlord’s legal removal of a tenant from a rental property. There are many different reasons why a landlord may evict a tenant. They include rent not being paid and breach of the rental agreement. Pay rent or quit notices are typically given to a tenant when they have not paid the rent. These notices give the person in question a few, typically three to five, days to pay the rent. If the tenant is unable to pay, they must move out. Cure or quit notices are given to a tenant when they violate a term or condition of the lease or rental agreement. This might be something such as violating a no-pet clause or if there has been excessive noise being made. A cure or quit notice gives the tenant a few days to cure (correct) the violation or they will be evicted. Even if you have not violated the rental agreement, a landlord can ask a tenant to move out at any time, given that the tenant doesn’t have a fixed term lease. A landlord can give their tenant a 30-day or 60-day notice to vacate. In this case, the landlord does not need a reason to tend the tenancy. However, many cities with rent control require the landlord to prove a reason for termination. These laws are known as eviction protection. Once a tenant receives a termination notice, they must move out of the rental property within the specified time. If the tenant hasn’t moved out before the period is over, the landlord will serve the tenant with a summons and take the tenant to court. 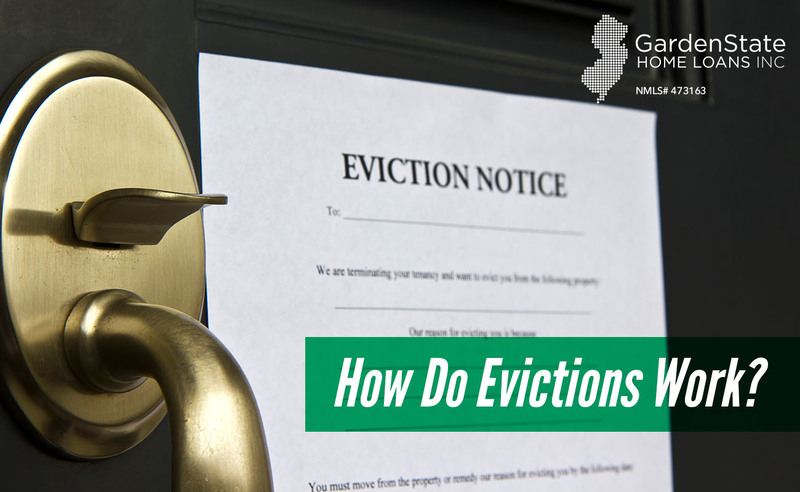 A self-help eviction occurs when a landlord doesn’t go through legal means to remove a tenant from a property. In this case, a landlord tries to coerce, intimidate, or make the tenant’s living conditions worse to attempt to force the tenant out of the property. A landlord must provide the tenant with a notice or quit or pay rent or quit. As mentioned before, this informs the tenant that eviction proceedings will be initiated and the reason for the proceedings. No evidence is important during actual eviction proceedings. 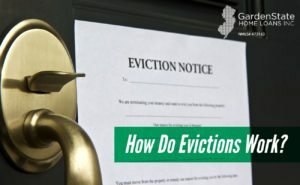 This occurs when a landlord does not have proper evidence to support the claims for an eviction. https://www.gardenstateloans.com/wp-content/uploads/2017/12/eviction.jpg 800 1300 Dori Gelman https://www.gardenstateloans.com/wp-content/uploads/2017/05/fb_logo-300x141.jpg Dori Gelman2017-12-15 09:30:322017-12-15 09:07:49How Do Evictions Work? 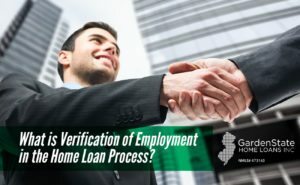 What is Verification of Employment in the Home Loan Process? When applying for a mortgage loan, a lender will have to verify your employment. The lender needs to make sure you are and will remain employed to ensure all income sources are taken into consideration. Why is verification of employment done? Employment is verified early in the loan process to ensure that you qualify for the loan. However, employment will be re-verified before closing to make sure nothing has changed. Any change in your job can affect your ability to pay your monthly mortgage payment. It is often encouraged to avoid changing jobs or to take out new loans or lines of credit when applying for a mortgage. During the home loan application process, lenders will calculate front-end and back-end ratios. The front-end ratio compares your gross income to your potential housing payment. The back-end ratio compares your total monthly debt (which includes your housing payment) to gross income. These both indicate whether you can afford to pay back your mortgage. Lenders will generally require a front-end ratio to be in the low 30% range. A back-end ratio should be no more than 45%. There may be some flexibility depending on the borrower’s credit profile. As it comes closer to the time of closing, lenders will verify your income to ensure that there has been no reduction. A reduction in income increases your debt-ratios. 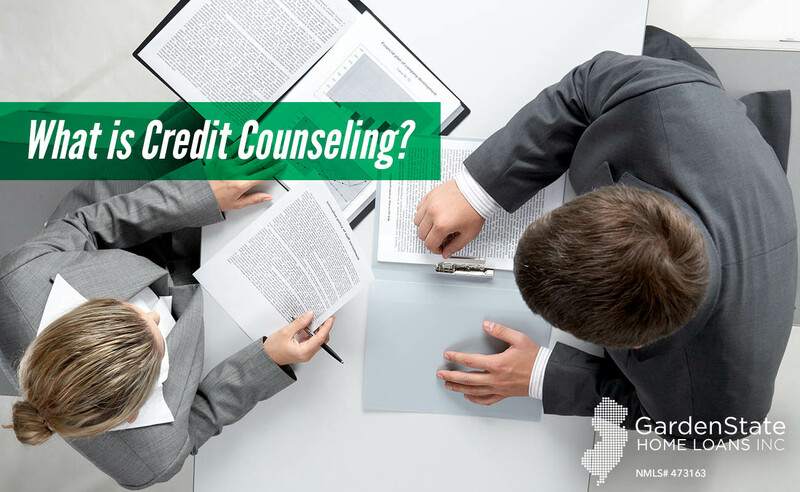 A lender will call your employer to confirm the information you provided them. The lender may also confirm this information by fax or mail. 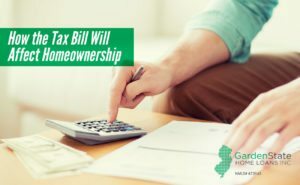 It’s possible that a lender will accept recent pay stubs or income tax returns and a business license for a borrower who is self-employed. 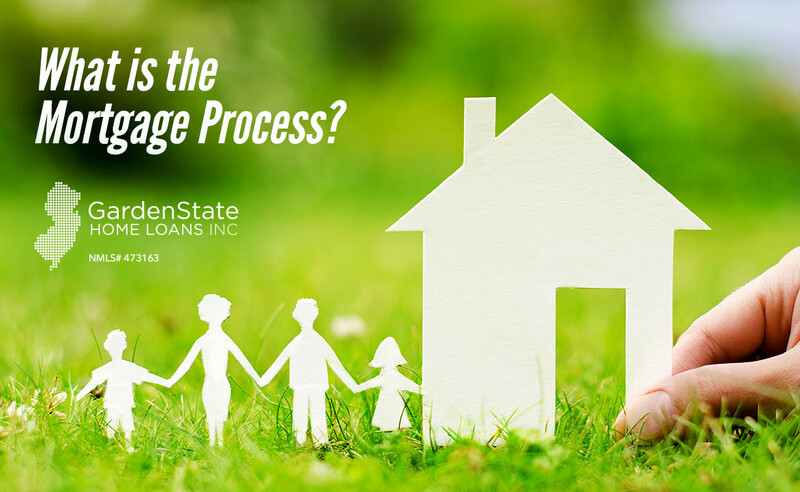 However, most loans will require a more thorough employment check, as detailed by Fannie Mae’s, Freddie Mac’s, or the Federal Housing Administration’s guidelines. https://www.gardenstateloans.com/wp-content/uploads/2017/12/employment-verification-home-loans-process.jpg 800 1300 Dori Gelman https://www.gardenstateloans.com/wp-content/uploads/2017/05/fb_logo-300x141.jpg Dori Gelman2017-12-11 16:31:012017-12-11 09:37:39What is Verification of Employment in the Home Loan Process? Basis points are a common unit of measurement for interest rates. A basis point is equal to 1/100th of 1%, 0.01%, or .0001. This means that a 1% change is equal to 100 basis points, or 0.01% is equal to 1 basis point. They are used to denote the percentage change in a financial instrument. 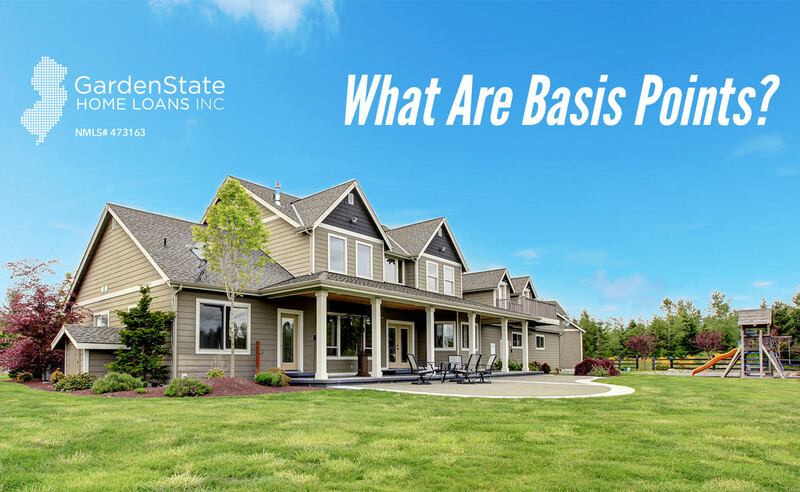 Although basis points are small, they can affect your interest rates and the costs to finance your home. Are basis points important to lenders? Basis points can be more important to lenders than they are to borrowers. When dealing with large-volume mortgage lenders, basis points can mean the difference between a profit and a loss. Why are basis points used? Basis points are popular for larger investments, such as mortgages. This is because smaller increases or decreases in interest rates can represent larger dollar amounts. A small increase in basis points can represent a large change in your interest rate. How are mortgage basis points used for consumers? Once a borrower begins to compare mortgage rates and terms, it’s likely they will face basis points. A borrower talks to their loan officer and tells them that they want to lock in their rate. The loan officer advises the borrower that the lender will charge a certain amount of basis points for locking in your rate for that period. For example, if your lender charges 50 basis points, you will have to pay one-half of 1 percent of your mortgage loan for your lock period. How does a hike in basis points affect a mortgage? Mortgage payments are composed of interest and principle. When the interest rate goes up, the payment goes up. The payment going up can prevent you from qualifying for a loan. To qualify for a loan, you must be able to repay the loan. If the interest rate hike means that you won’t be able to repay the mortgage, it’s possible that you won’t be approved. https://www.gardenstateloans.com/wp-content/uploads/2017/12/basis-points.jpg 800 1300 Dori Gelman https://www.gardenstateloans.com/wp-content/uploads/2017/05/fb_logo-300x141.jpg Dori Gelman2017-12-07 16:30:142017-12-07 09:12:26What Are Basis Points?